Looking for leftover ham recipes? 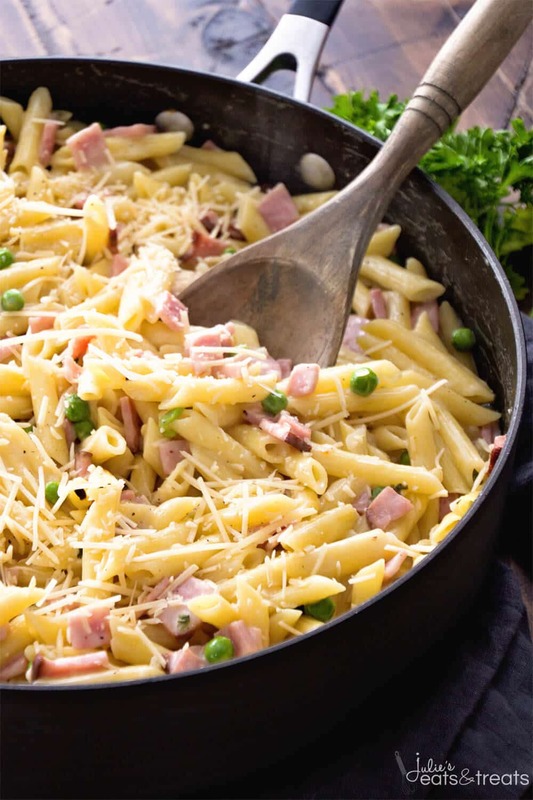 This One Pot Ham & Penne Skillet is the perfect one to use! 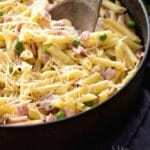 It has diced ham, penne pasta and peas in a creamy sauce. 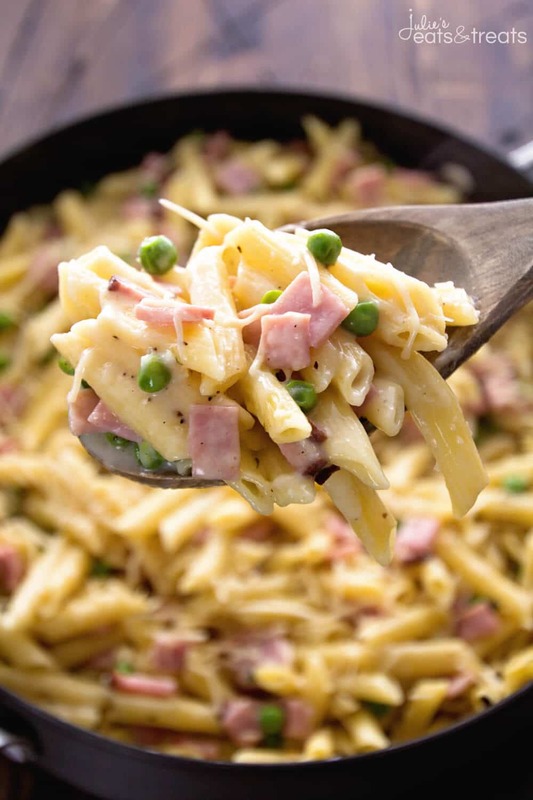 It makes a quick and easy one-pot meal when you are wondering what to make with leftover ham! Plus, the kids love it and so do adults. Throw this in your pot and make it tonight for dinner! Easter week is here! That means you’ll be dying Easter Eggs and eating lots of ham, which also means leftover eggs perfect for Deviled Eggs or Deviled Egg Salad Sandwiches and leftover ham perfect for this pasta dish next week! I couldn’t believe it when I looked at the calendar and it was this week. Apparently, I thought there was another week in there. I was greatly mistaken and left scrambling for things like a white cardigan for RyRy. Ahem. One would think they would be all over the place this time of year because Easter dresses for children are sleeveless, we live in Minnesota, therefore we need cardigans. Logical huh? Well, no it’s not or at least not in the eyes of Target, Carters etc…. Can you put warm ham in the fridge? No, it’s best to allow it to cool to room temperature. Then wrap it well in either tinfoil or plastic wrap and tuck it into the refrigerator. If you have leftover Honey Baked Ham just wrap it well. It will store nicely in the refrigerator for several days – 7-10 days. Back to my cardigan fiasco. So I’m trolling the internet looking for one that would be here by the end of the week and I was up in arms about it. I explain my frustration to my hubs and he gets to work looking for one. He’s a rock star, which I already knew, because he found me one and I’m praying it will be here on Friday like it says! I also had to order new shoes for Miss K because the shoes I put on her last week didn’t fit this week. Kids. I swear they grow overnight some of the time! So as long as all of this arrives on time I should have two cute matching girls to show off at Easter. Yes, I love to make them match and Miss K thoroughly enjoys it so I’m going to do it as long as I can because pretty soon that won’t be cool at all and neither will I. Sigh. I’m not looking forward to that! Leftover ham freezes beautifully. Wrap it well in several layers of foil and seal in a large plastic bag. Well sealed, the ham will last up to six months in the freezer. Now onto this pasta at hand! You guys it’s like amazing, done in around 30 minutes and it’s got your veggies and pasta all in one dish! I couldn’t stop eating it when I made it and I look forward to whipping it up again soon. The sauce is homemade but it’s so ridiculously easy plus it’s as light as a pasta is going to get so dig in and enjoy it! Another one of our favorite leftover ham recipes is this Ham Bean Soup! Place olive oil in a large skillet over medium heat until warm. Saute ham and onions until onions are translucent. Add garlic, parsley, basil, oregano, pepper and red pepper flakes; cook 1-2 minutes. Stir in broth, milk, flour and penne noodles, cook 10 minutes. Adds peas and cook five more minutes or until pasta is cooked through and peas are warm. Sprinkle Parmesan cheese on top of pasta. For more easy diced ham recipes, check out these! 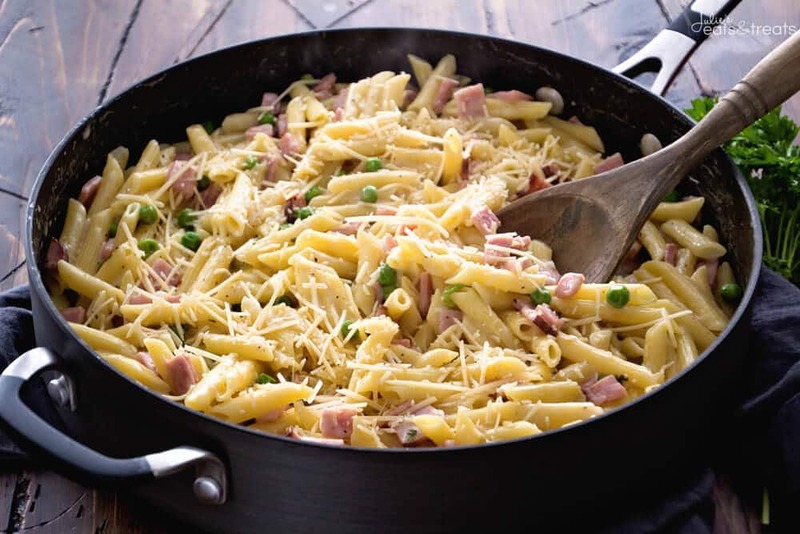 Do you love this skillet pasta meal? I thought you would! Be sure to comment below, I definitely want to hear from you!!! Are you like me and snap photos of everything you eat? Be sure to tag me on Instagram @julieseatsandtreats or #julieseatsandtreats that way I’m sure to see your pictures!! Delicious Pasta Perfect for a Quick Dinner! 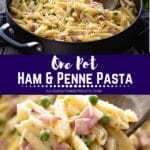 Loaded with Ham, Penne and Peas! 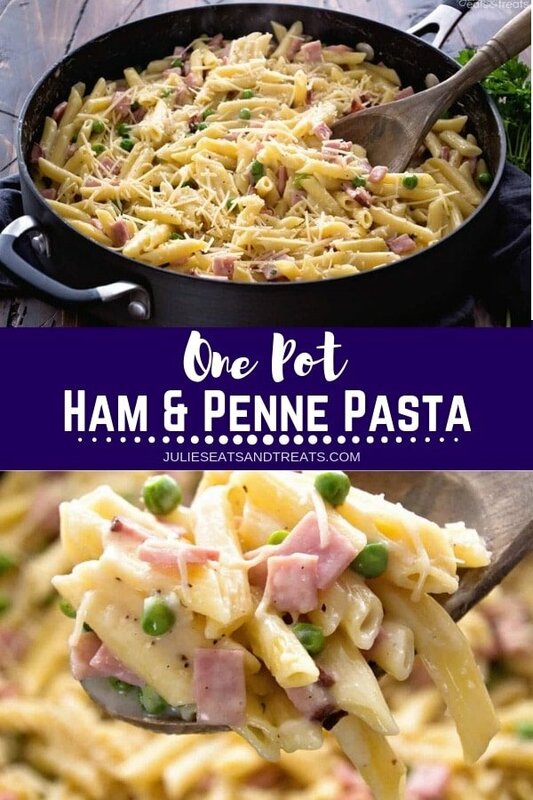 This an easy dinner using leftover ham from the holidays! Place 1 Tbsp olive oil in a large skillet over medium heat until warm. Saute ham and onions until onions are translucent. Add garlic, parsley, basil, oregano, pepper and red pepper flakes; cook 1-2 minutes. Stir in broth, milk, flour and penne noodles. Cook 10 minutes. The sodium content is extremely high. Is that accurate? Hoping to try this for dinner tonight. Enjoyed this dish for left over ham. 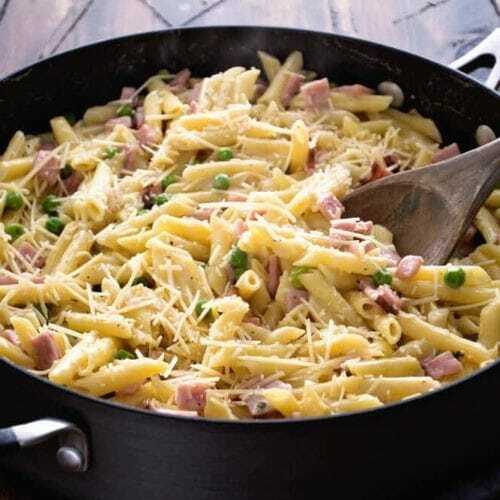 Like one pot meals – meat, pasta and vegetable. So glad you enjoyed it Judy! 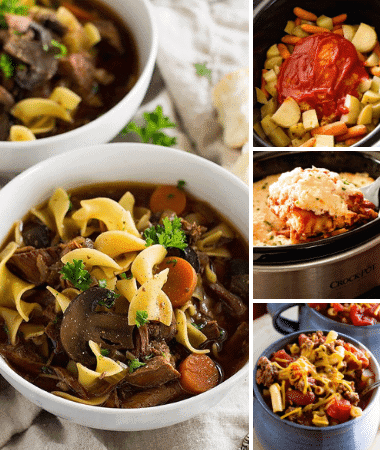 One Pot Meals for the win! Instructions are not clear enough. Usually you boil water before adding pasta. It doesn’t say that and when I added flour it turned to lumps. We will see how finished product turns out. Right now I’m frustrated! So easy and delicious! My boys all loved it, even the two year old. One pot meal for the win! Where is all the Sodium coming from as listed for this recipe?? Ham is high in sodium. If you are looking to lessen sodium you can use less ham and I always use chicken broth with reduce sodium.